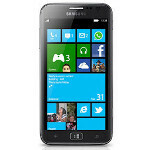 Three major Canadian carriers are now offering the Windows Phone 8 powered Samsung ATIV S. If you can imagine a Samsung Galaxy S III running on Windows Phone 8, then you can picture this device. From the 4.8 inch HD Super AMOLED display to the dual-core 1.5GHz Qualcomm Snapdragon S4 Plus MSM8960 under the hood, the device matches the Android flagship model. One of the differences is the lower amount of RAM (1GB) in the Samsung ATIV S. Also, the 16GB of native storage on the Windows Phone 8 device is half that on the Samsung Galaxy S III. Canadians aren't happy with three-year contracts, but until changes are made, they are stuck with them. 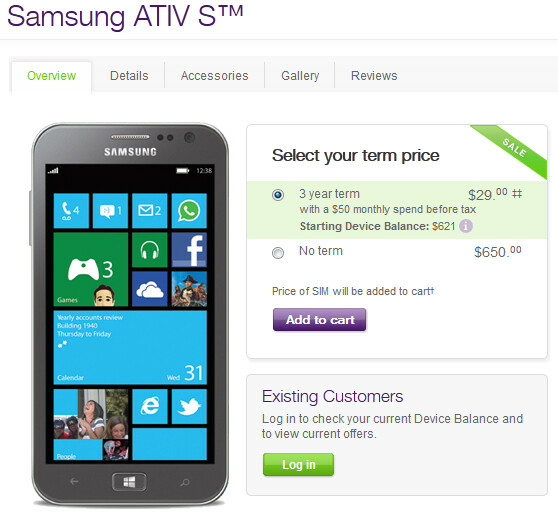 The Samsung ATIV S is priced as low as $29 with a three-year pact from TELUS to $79.99 at Rogers and $99.95 from Bell. Don't want the handcuffs for 36 months? The off-contract pricing runs from $599.95 (Bell) to $650 (TELUS). If you're interested in the Samsung ATIV S, it might be best not to delay. All three carriers say that the phone is available in limited quantities. Until Microsoft make peace with Google, you wont be confident Microsoft Sync will work for more than another month. If that isnt working your Windows 8 phone is going to turn into a BRICK. Hotmail is better than google mail and its now apart of outlook. I got rid of my Gmail and haven't skipped a beat. Gee.... Can't imagine WHY Canadian consumers so not like three year deals. I like my Focus S, but the idea that I would HAVE to keep it until November 2014 as top end device after top end device is introduced would be agonizing, and I would end up spending a lot for a device out of pocket. Almost makes me wonder if my Northern Neighbors would leave in droves for a carrier that offered a 2year deal. Looking excitedly to one or two US carriers picking up this WP monster. I am excited to see how it measures up to the HTC 8X and the 920. @andrew1953 why do you need google Gmail? Outlook and WP works flawless. Outlook is clean, simple, and beautiful. It also connects to your cloud easily! I'm sure what magical thing have. If there is, I've never seen it. Anyway, you Google make peace with MS. Its Apple's war. Remember, Steve Jobs wants to nuke Android. Anyway I can't seem to keep the editing, thumbs up, thumbs down, option open.